Most everyone has lost at least one appliance or electronic device due to a power surge or lightning strike at some point, but a quality surge protector can help protect your valuable equipment from damage during the next one (and believe me, there WILL be a next one). For maximum protection, it’s essential that you choose the best surge protector for the device(s) in question. And when it comes to surge protectors, the “best” doesn’t automatically mean the most expensive. Some high-end (i.e. expensive) models actually offer less real protection against power surges and lightning strikes than some of their lower priced counterparts. 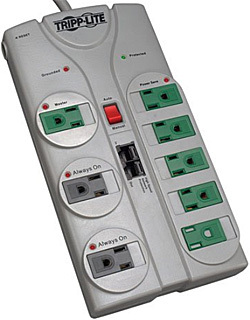 1 – A power strip does nothing more than take a single electrical outlet and expand it into a number of extra outlets. In other words, instead of using a single wall outlet to power a single device, a power strip lets you power several devices from that single outlet. The better power strips will provide circuit overload protection in the form of a fuse or circuit breaker, but no other protective devices are included. 2 – The most common form of surge protector is basically a power strip that includes circuitry to protect the devices that are plugged into it from power surges and moderate lightning strikes. These devices work by detecting incoming power surges and shunting the excess voltage and current to ground, protecting the connected devices from being damaged by the surge. 1 – If lightning happens to strike the power line near your home, there is a good chance that the resulting power surge will take out both the surge protector and everything connected to it. Why? Because no consumer grade surge protector is strong enough to withstand the immense power generated by a direct lightning strike. But that doesn’t mean you shouldn’t use one because direct lightning strikes are relatively rare. Most strikes actually occur some distance from the home. 2 – Even the best surge protector won’t last forever. The electronic components that provide the protection by shunting over-voltage and current to ground break down from regular use. They in effect sacrifice themselves in order to protect the (usually) more expensive items that are plugged into them. Since their effectiveness is diminished every time they are required to spring into action (which is more often than you might think), over time they simply lose the ability to protect your equipment from another surge. And in the case of a direct lightning strike, they can be rendered ineffective immediately. Some models include a visual indicator that lets you know when the surge protector is no longer providing adequate protection so you can replace it before another power surge damages your equipment. Some of the higher end models allow you to replace the protective components after they go bad instead of the entire unit, but I don’t really recommend those for the average user. I do recommend replacing your surge protector(s) immediately after your home’s power grid is struck by even one major power surge or lightning strike, even if the unit shows no apparent signs of damage. And if you live in a storm-prone area, it’s a good idea to replace them every year after the storm season has ended. 1 – Choose a surge protector that has enough protected outlets to power and protect all the devices that you need to attach to it. I have seen surge protectors with as many as a dozen protected outlets. Resist the temptation to “daisy chain” multiple surge protectors by plugging them into one another because that daisy-chaining reduces the effectiveness of every surge protector in the chain. 2 – The amount of damaging excess energy that a surge protector can absorb is measured in Joules, and the more the Joules the better. For computer equipment I recommend buying a model that’s rated at a minimum of 2,000 Joules. 3 – Another thing to consider is the Clamping Voltage (the over-voltage threshold at which the protective components spring into action). I recommend buying a model with a maximum clamping voltage of 400 volts or less. The lower the clamping voltage the better, but the lower the clamping voltage the more the surge protector will cost. 4 – In addition to the factors mentioned above, you also need to consider the Response Time of the protective components contained within a surge suppressor. The longer it takes for your surge protector to begin shunting the excess voltage and current to ground, the more likely it will be that your equipment will be damaged or destroyed. I recommend choosing a model with a response time of 1 nanosecond or less. Yes, that’s an extremely short amount of time, but every nanosecond counts when it comes to power surges! 1 – Even the best surge protector won’t protect your gear if it’s plugged into an improperly wired electrical outlet. 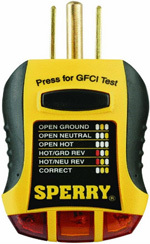 You can find out if your outlets are properly wired by purchasing an inexpensive electrical outlet tester . Outlet testers only cost a few bucks, and they are extremely easy to use. Simply plug the tester into an outlet and take a look at the glowing lights. If it indicates there is a problem with the wiring, an electrician or a handy neighbor can probably fix it in just a few minutes. Important: In addition to preventing your surge protector from working correctly, mis-wired electrical outlets can also cause you or someone else to experience an electrical shock. And depending on the nature of the improper connections, they can even cause a structure fire. 2 – As I explained in this post, the best surge protector for your computer equipment is actually a Battery Backup / UPS unit. In addition to keeping your expensive computer gear powered up during brief power outages, a quality UPS will also partially isolate the equipment that’s plugged into it from the external power grid altogether. 3 – You can also opt for whole house surge protection by hiring an electrician to install a “whole house” surge protector in your home’s breaker panel. This is by far the best surge/lightning protection the average home owner can get. And while it can be a relatively expensive option, the cost is reasonable and well worth the expense in my opinion. Bottom line: While any old surge protector is better than not having one at all, taking the time to choose the right one for your particular needs will pay off quite well in the long run. 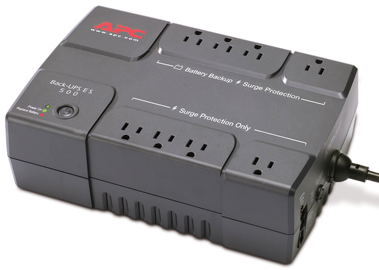 Click here to check out the great selection of surge protectors at Amazon. The listings there include plenty of information regarding each unit’s possible uses and specifications.